The fans were always going to come back when the lockout ended, as long as those idiots didn’t push their ego clash into a full cancelled season. With that established, the strong ratings for NBC on opening day should have been expected. But boy, were they strong, in context. The overnight ratings for Pittsburgh (19.4), Philadelphia (7.8) and Chicago (6.6) were NBC's best-ever in those markets for the NHL regular season, excluding Winter Classics. The 1.5 rating for Los Angeles was best for that market, excluding Winter Classics, since NBC's NHL regional telecast on March 4, 2007 (Colo-Det/Phil-Pitt/Caro-Atl; 1.8). While the ratings were good, it’s the same formula of dependable markets and good fortune that fuel these numbers for the NHL, just like they do in the Stanley Cup Final. 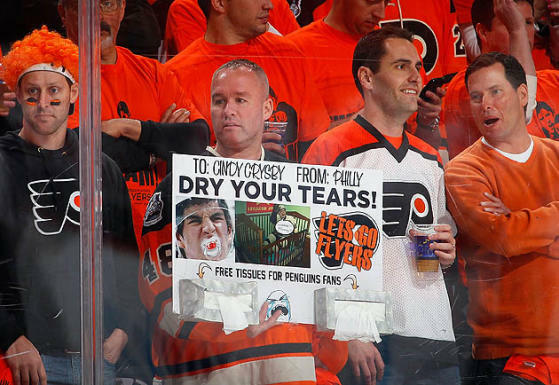 Not only are the Flyers and Penguins the hottest rivalry in the League, but this was their first game since the chaotic circus of a playoff series last season – and, in case you couldn’t tell, the Penguins can push a national number (38 share!). The Los Angeles Kings were raising a banner. The Chicago Blackhawks are a team that’s red-hot locally. In other words, it’s a bigger story if the NHL didn’t pop this number than that it did. But it’s still an impressive start for the League after the lockout and a sign that its momentum on US TV hasn’t waned.